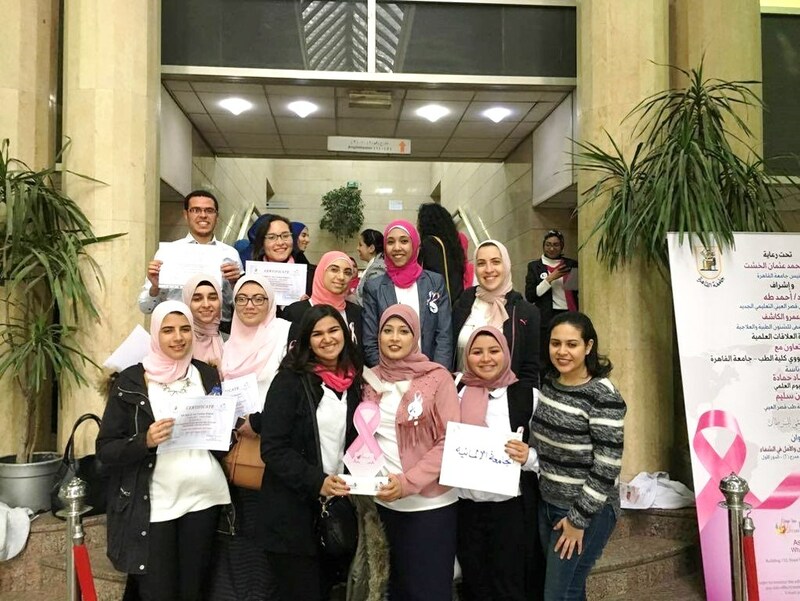 German University in Cairo - In the Cancer International Day, GUC Students Participate in Raising Awareness of Breast Cancer at El Qasr el Einy Hospital on 28th February 2019! 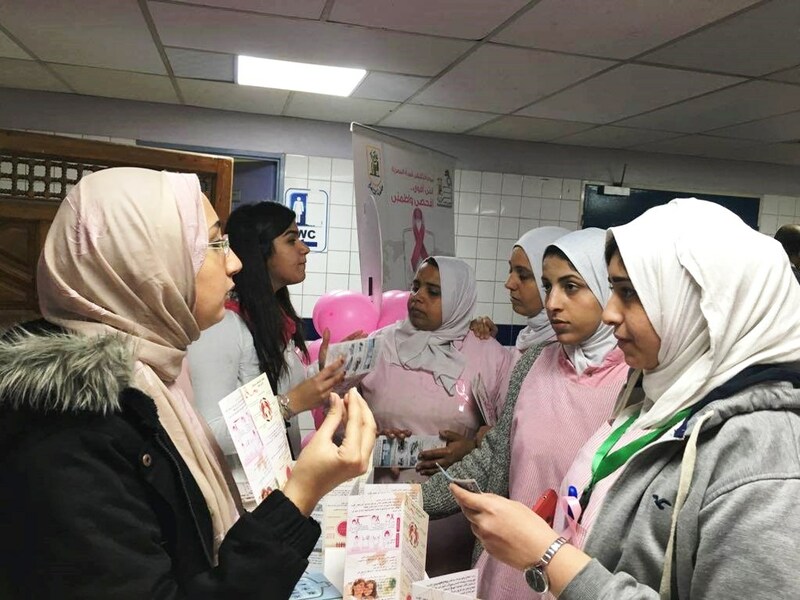 El Qasr el Einy Hospital celebrated cancer international day on 28th February 2019. 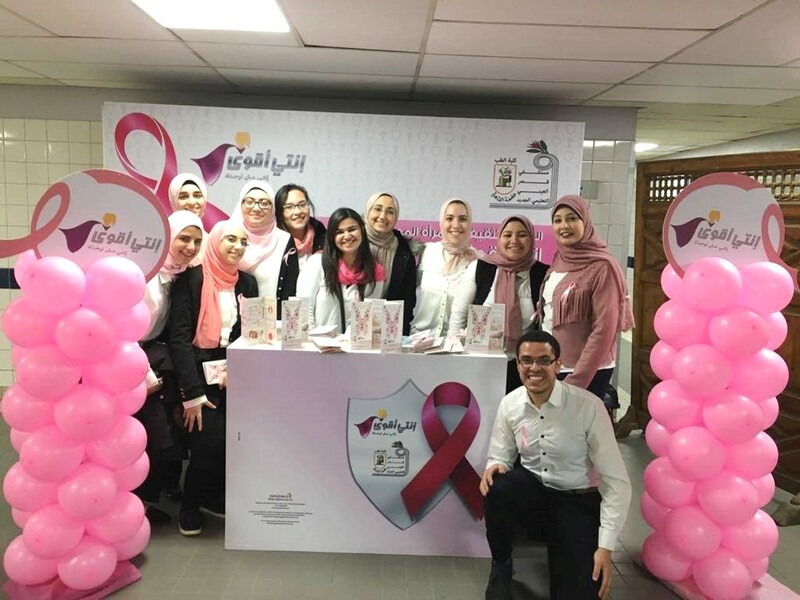 The hospital wanted to raise awareness of 3 main cancers: Breast, colon and lung cancer with the help of 3 teams from 3 universities GUC, BUE, and Cairo University. GUC team were 10 students from the 5th year faculty of pharmacy. We took breast cancer topic and radiotherapy treatment to do research for and make flyers. We went the first meeting to discuss the day and assign each team for a cancer type and choose the team leader. We took breast cancer, Cairo University took colon cancer and BUE took lung cancer. We met our 2 supervisors, one was for the 3 teams and the other one was only for GUC team. We created a group to reach each other. We were asked to search for questions to answer in the flyer for breast cancer awareness. Each one thought of what might be helpful for most of the people and patients, their families and healthy persons. A small survey on social media was done to make sure that most of the questions that are of high concern to many people are answered. Then the questions were collected together in the group and we started doing research. Then all the information were judged by the supervisor and we edited according to her recommendations and the information was collected in the form of the flyer by the team leader. The same was done for the radiotherapy flyer. A second meeting was held in the hospital, 3 of the teams represented the team in this meeting due to clash with time of running slots in the university. In this meeting we discussed the dress code in the day itself and what extra information we should give to the people there and what are the frequently asked questions and we discussed also 2 other flyers that were made by the other faculties chemotherapy and nutrition. We prepared well for the day, increased our knowledge to give people the maximum benefit we can in the campaign. The flyer contained instructions to help in early detection of breast cancer and how self- examination is done and other information about the treatments and post-surgery instructions that all were written in easy Arabic language so any non- medical related person can easily understand. On the campaign day, the booth was made for the team. The campaign started at 10 o’clock and at 10:30 awareness lectures started and the team was Split, some attended the lectures and some stayed in the booth and spread the information with any patients or nurses or anyone came to the booth. 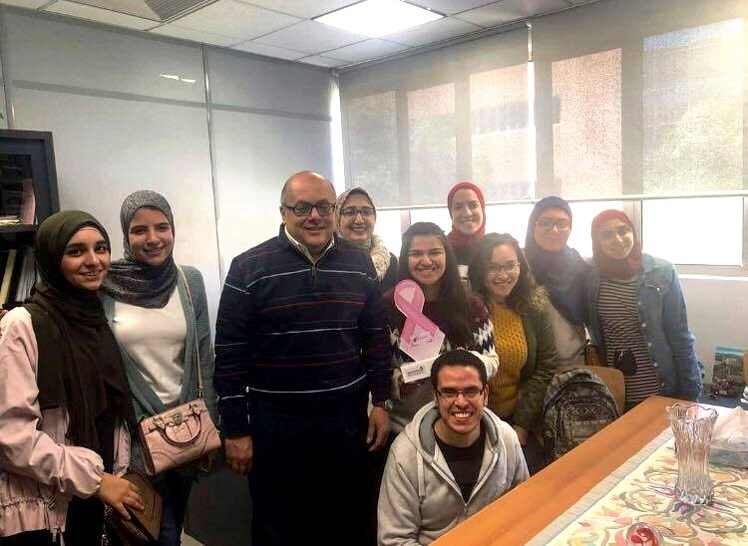 Pink ribbon which is the symbol for supporting breast cancer’s patients were made and given to the people by the team and at last the team met Dr. Ahmed Taha, the hospital’s manager, and were greeted by him and awarded a trophy for the university and certificates for all the team members.